France have received a blow ahead of their quarter-final with England after centre Fabrice Estebanez was hit with a three-week ban for a dangerous tackle in their loss against Tonga on Saturday. He received a yellow card for the tip tackle on Tonga substitute Joseph Tuineau in the second-half of Les Bleus' 19-14 Pool A defeat in Wellington, Marc Lievremont's side going on to clinch the losing bonus point needed to secure their quarter-final berth. The 29-year-old has 48 hours in which to appeal the decision, but as things stand he will miss Saturday's last-eight clash with England in Auckland. Estebanez was cited yesterday by independent citing commissioner Steve Hinds of New Zealand, and the case was heard in Auckland today by the independent judicial officer Christopher Quinlan QC of England. 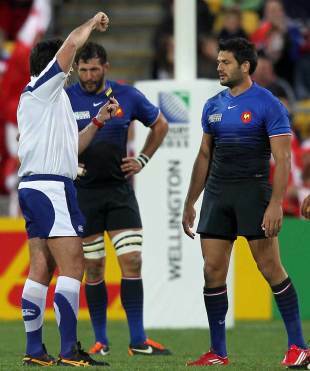 A statement from Rugby World Cup Limited today read: "Fabrice Estebanez of France has been suspended for three weeks after admitting committing tackle contrary to law 10(4)(j). "Following a review of broadcast footage, Estebanez was cited by independent citing commissioner Steve Hinds (New Zealand) under Law 10.4(j) for a 'dangerous tip tackle' in the Rugby World Cup 2011 Pool A match against Tonga in Wellington on October 1. "Estebanez was suspended by independent judicial officer Christopher Quinlan QC (England) in accordance with the Rugby World Cup 2011 disciplinary process." The statement continued: "Having conducted a detailed review of all the evidence available, including all broadcast angles and submissions from his legal representative, the judicial officer upheld the citing under law 10(4)(j). "With respect to the sanction, the offence was deemed to be mid-range, which has an entry point of six weeks. However, taking into account mitigating factors, including his admission and good character and the absence of aggravating factors, the player was suspended for a period of three weeks. "The suspension takes effect immediately will run up to and include October 24. He is free to resume playing on October 25. The player has 48 hours in which to appeal from the time he was informed of the decision." The news comes as a further blow for a troubled French camp, with fellow centre Aurelien Rougerie a major doubt due to a dislocated shoulder and captain Thierry Dusautoir also struggling with a shoulder problem. Lievremont conceded after the "shame" of Saturday's shock defeat to Tonga that his squad were not united in pursuit of a first Rugby World Cup title - comparing his squad to the French football team, who refused to train at the 2010 World Cup following a row between then coach Raymond Domenech and striker Nicolas Anelka.